Toronto – August 24, 2018 – UFCW Canada, the country's leading union, today released its Annual Report, detailing the union’s core activities, growth, and accomplishments in 2017. The 38-page report showcases major achievements in UFCW Canada’s collective bargaining, political action, organizing, and education efforts over the previous year, and explores the union’s advocacy on behalf of women, young workers, and equity-seeking groups during that period. In addition, the Annual Report provides important metrics on UFCW Canada’s core activities and outlines the union’s charity and fundraising work with the Leukemia & Lymphoma Society of Canada (LLSC) and United Way Centraide Canada. "2017 saw our union win major legislative victories for workers and their families, launch bold new initiatives at the 12th National Council Convention, and continue our outstanding fundraising efforts for the LLSC and United Way, among other notable accomplishments,” says Paul Meinema, the National President of UFCW Canada. "Our union’s tireless work in these areas not only helped to advance workers’ rights across Canada, but also put us in a stronger position to bring the union advantage to more workers and make a positive, lasting difference in our communities,” the UFCW leader adds. 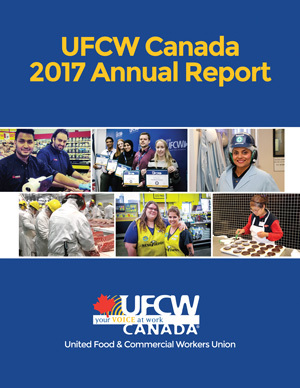 Full copies of the UFCW Canada Annual Report can be downloaded in PDF format at www.ufcw.ca/annualreport2017. UFCW Canada is the country's leading and most progressive union, representing more than 250,000 union members in Canada’s fastest-growing industries, including the Food Retail and Processing, Hospitality, Health Care, Security, Industrial, Agricultural, and Office & Professional sectors.